According to the 2017 11th Annual State of Agile™ Survey, the leading cause of failed Agile transformation is "company culture at odds with core Agile values". As a result, Madison Henry often incorporates diagnosing and aligning organizational culture when helping organizations realize the benefits of Agile Software Development. Madison Henry leverages an industry leading framework and instrument for diagnosing your organizational culture, the Competing Values Framework (CVF) and Organizational Culture Assessment Instrument (OCAI) respectively, developed by University of Michigan business professors Kim Cameron and Robert Quinn. The CVF and OCAI are arguably the most dominant framework and frequently used instrument respectively, for diagnosing organizational culture across the world today, having been used by thousands of organizations and extensively in scholarly research. Similar to Agile, the CVF is empirical, having been utilized and studied for more than 25 years. Consult on your OCAI Survey participants and communication strategy. Administer and provide instructions for your online OCAI Survey. Compile, analyze and present your OCAI Survey quantitative results. Provide insight into your organization's dominant culture and mix of cultural types. Facilitate consensus on your organization's current and preferred culture and desire for change. Identify opportunities to align your preferred culture with Agile transformation. Prepare and present qualitative organizational culture findings and recommendations. The Competing Values Framework (CVF) was developed to identify the criteria, key factors and indicators of organizational effectiveness. The CVF consists of two cultural dimensions that form four quadrants of cultural types to represent a distinct set of organizational effectiveness indicators and symbolize a way of being, seeing, managing and organizing. Vertical Dimension – The vertical cultural dimension differentiates organizational effectiveness criteria such as flexibility and discretion from criteria that emphasizes stability and control. As an example, some organizations are deemed effective if they are adaptable and changing while other organizations are considered effective as being predictable and stable. Horizontal Dimension – The horizontal cultural dimension differentiates organizational effectiveness criteria such as internal focus and integration from criteria that emphasizes external focus and differentiation. As an example, some organizations are deemed effective if they are focused on what's important internally and how they want to work while other organizations are considered effective if they are focused on what's important externally such as clients and competitors. Clan (Collaborate) Culture – An organization that focuses on internal maintenance with flexibility, concern for people and sensitivity for others; value drivers include commitment, communication and development. 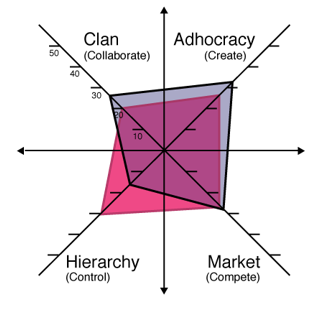 Adhocracy (Create) Culture – An organization that focuses on external positioning with a high degree of flexibility and individuality; value drivers include innovation, transformation, and agility. 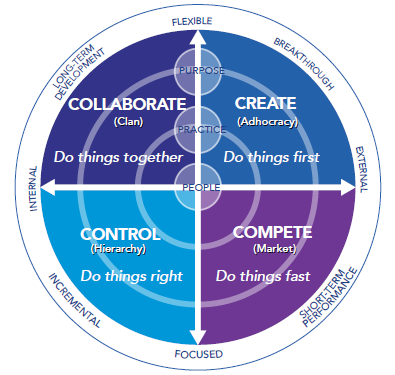 Hierarchy (Control) Culture – An organization that focuses on internal maintenance with a need for stability and control; value drivers include efficiency, timeliness, consistency and uniformity. Market (Compete) Culture – An organization that focuses on external positioning with an emphasis on competition and fast decision-making; value drivers include market share, goal achievement and profitability. Through a comprehensive, 20 minute online survey, the Organizational Culture Assessment Instrument (OCAI) measures the mix of the CVF's four cultural types for current and preferred organizational culture along with an organization's desire for change. Develop organizational culture change vision, strategy and plan. 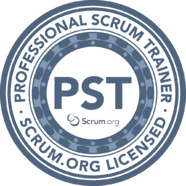 Scrum Team – Product Owner, Scrum Master and Change Team. Scrum Events – Sprints, Sprint Planning, Daily Scrum, Sprint Review & Sprint Retrospective. Scrum Artifacts – Change Backlog, Sprint Backlog & Increments.